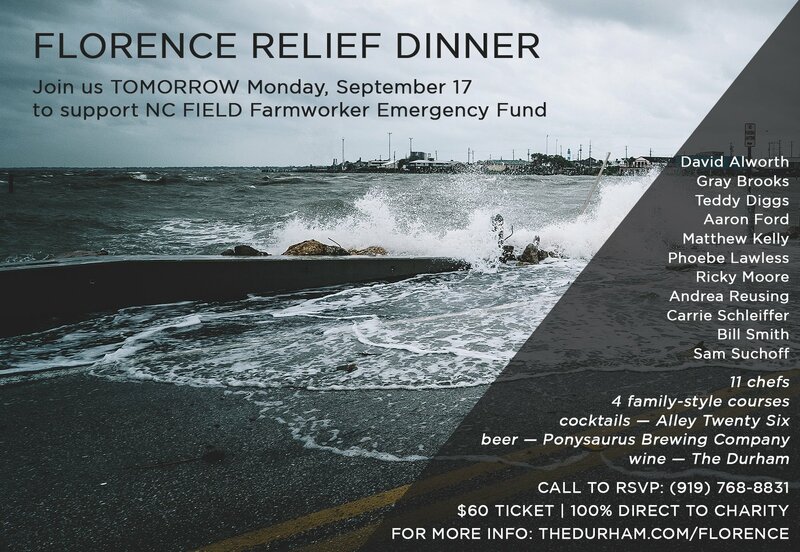 On Monday, September 17, The Durham is hosting a Florence Relief Dinner to support NC FIELD Farmworker Emergency Fund. Chefs and industry partners will come together to prepare a four-course family-style dinner with cocktails from Alley Twenty Six, beer from Ponysaurus Brewing Company and wine from The Durham. 100% of proceeds will go directly to basic necessities for displaced farmworkers and their families in Eastern, NC. Call to RSVP at (919) 768-8831. NC FIELD is a non-profit organization that works with migrant and seasonal farmworker youth and families utilizing grassroots organizing principles to teach leadership, promote education and facilitate opportunities. Alongside the Farmworker Emergency Fund, NC FIELD has also piloted the New Horizons initiative to provide farmworker children and youth safe alternatives to working in the fields so that they can avoid associated health and safety hazards, depend on their education, and pursue work alternatives that can lift them out of poverty.